Southeast Alaska: Sitka Sound sac roe herring fishery closed rest of 2013 season - The Alaska Department of Fish and Game has closed the Sitka Sound sac roe herring fishery for the remainder of the 2013 season. The last competitive fishery occurred on March 30th and since then the ADF&G has not been able to identify a body of good quality herring to hold another competitive opening. On April 3rd, the fishery was opened under a cooperative agreement among permit holders and the agreement initially allowed up to 480 tons of herring to be harvested with additional harvests based on the results of this initial harvest allotment. The Sitka Sound herring sac roe regulatory district, which includes the waters of Salisbury Sound south of the latitude of Point Kakul, Sitka Sound and contiguous waters and western Baranof Island south to Aspid Cape was opened under this agreement from 8:00 a.m. until 6:00 p.m. on April 3rd. Southeast Alaska: ADF&G Announces 2013 Southeast Alaska Chinook Salmon Harvest Quota - Under provisions of the Pacific Salmon Treaty, the Alaska Department of Fish and Game (ADF&G) announced that the preseason Chinook salmon all-gear harvest quota for Southeast Alaska in 2013 is 176,000 fish. This year’s quota is 90,000 fish lower than the 2012 allowable preseason Chinook all-gear harvest level of 266,800. According to the Alaska Department of Fish & Game, the Chinook harvest in Southeast is allocated to sport, commercial troll, and commercial net fisheries under management plans specified by the Alaska Board of Fisheries. Fish Factor: Push back by halibut buyers; Sitka spawns out; Kings sink in Southeast & more... By LAINE WELCH - Absent from supermarket fliers this spring have been ads featuring the year’s first fresh halibut, reflecting the anticipated push back by buyers to the high priced fish. “No ads in the papers. No excitement this year,” said more than one major buyer. In recent years, dwindling supplies of halibut helped push up dock prices to more than $7/lb at major ports, and halibut fillets topped $20/lb at retail. That’s not the case this year. At 10th and M Seafoods in Anchorage, there was “not a lot of enthusiasm” for the season’s first halibut, which was was fetching $10.95/lb for H&G and $17.95 for fillets. “We’re selling lots more cod fish,” said owner Rob Winfrey. Just over one million pounds of Alaska halibut was landed by 172 deliveries through April 5 with about 21 million pounds left to go. Lots of buyers are also still holding onto high priced sablefish (black cod), and those prices also took a 40% dive at the start of the season. Starting prices in Southeast ranged from around $5 to $3/lb the first week, compared to $8- $4 a pound last year. Most of Alaska’s sablefish goes to Japan, where the yen value is down 20%. For sablefish, 1.5 million pounds was landed by 87 deliveries out of the 28 million pound quota. Japan also buys all of Alaska’s herring roe, but they will get less than expected from Sitka. State managers closed the fishery on April 4, leaving more than half of the herring unharvested. In all, the fleet took 5,600 tons of the 11,600 ton quota. This is the second year in a row that spawning has out-paced the commercial harvest at Sitka Sound, dramatically reducing the numbers of unspawned females, whose egg skeins are the money-making product of the sac roe fishery. No word yet on herring price. Kodiak’s roe herring fishery opens April 15 with a 5,410 ton harvest quota. Alaska’s largest roe herring fishery is at Togiak in Bristol Bay in early May. A catch of 30,000 tons is expected to come out of that fishery. Alaska Science: Hybrid grizzly-polar bear a curiosity By NED ROZELL- When he heard the news of a grizzly-polar bear hybrid shot in Canada’s Arctic, Tom Seaton thought back to an unusual polar bear hide he’d once seen at Nelson Walker’s home in Kotzebue. 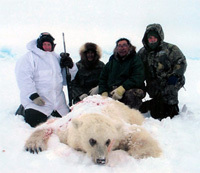 American hunter Jim Martell, left, is seen with a hybrid bear he shot while on a hunting expedition on Banks Island, Northwest Territory, Canada, in April 2006. Genetic tests showed the bear had a polar bear for a mother and a grizzly bear for a father. Roger Kuptana, center, right, was the guide on the expedition. The other men are unidentified. 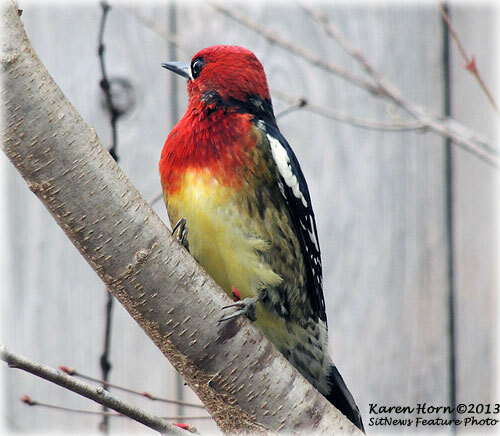 (Photo courtesy Canadian Wildlife Service). Walker, who has since passed on, was a polar bear hunting guide in the village; Seaton was then a teenage hunter who loved to listen to Walker’s stories. He’s now a biologist with the Alaska Department of Fish and Game in Fairbanks. Because he had heard that polar bears and brown bears had bred successfully in a zoo, Seaton was pretty sure Walker’s white-and-brown hide was from the mating of a polar bear and a brown bear. That combination of large bears is so rare that DNA testing of the hybrid bear shot in 2006 off Banks Island in Canada’s high Arctic proved for the first time that a wild bear had a polar bear as its mother and a grizzly as its father. An Associated Press reporter wrote that the bear had brown patches on its white coat, long claws, and the humped back of a grizzly. 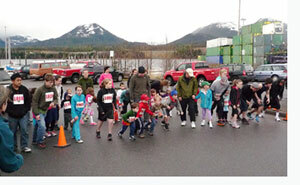 Ketchikan: Annual Sourdough Stampede Results - Seventy four runners and walkers raced the clock and the weather at Saturday’s Remax Sourdough Stampede in Ketchikan. This annual foot race features a one mile and 5K (3.1 mile) events. Alex Nelson was the top male runner in the one mile with a time of 6:24. Morgan Elerding was the top female runner in the one mile. Ten-year old Elerding crushing her last year's time with a 7:15 effort. Joel Jackson led the pack in the 5K race with a 21:13. First place female was Hilary Robbins at 22:10.